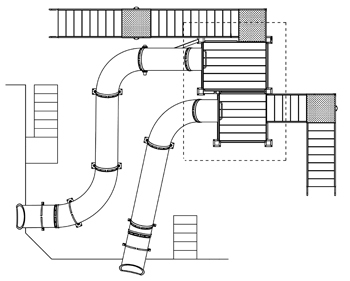 Centerline Run : 53' 2"
Entry Height : 11' 7" or 12' 2"
Space Requirements: 16' 3 " x 15' 10" – Space requirements vary with options chosen. 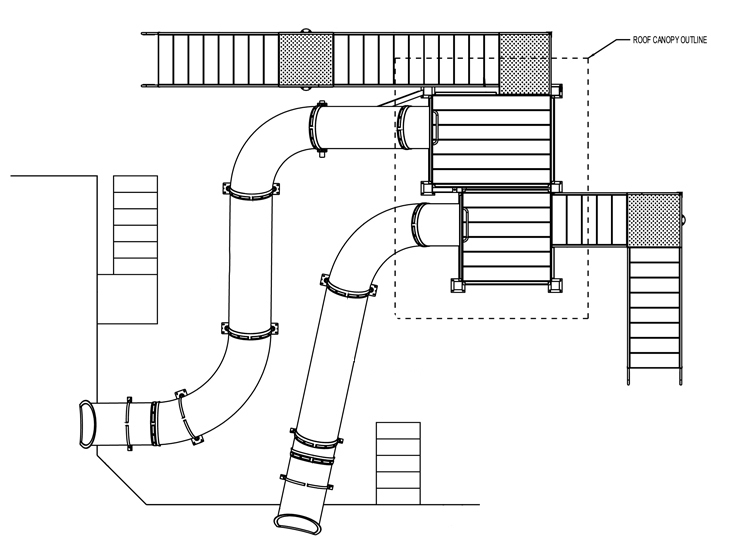 Centerline Run : 64' 11" & 58' 2"
Entry Height : 12' 2 "
Space Requirements : 31' 9 " x 19' 10 " – Space requirements may vary with options chosen. 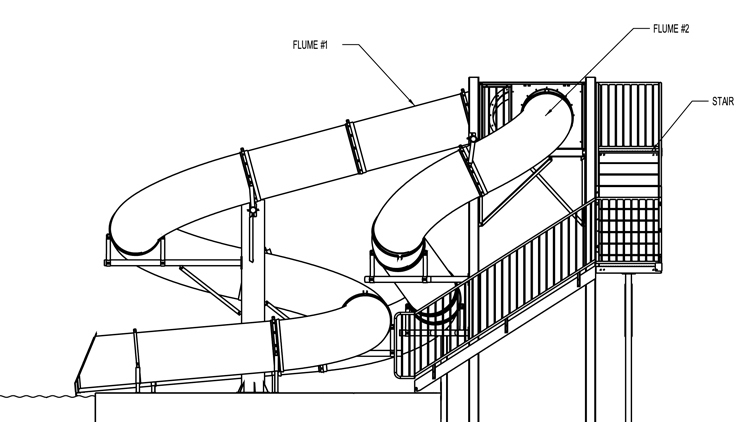 Double the flume - Double the action! 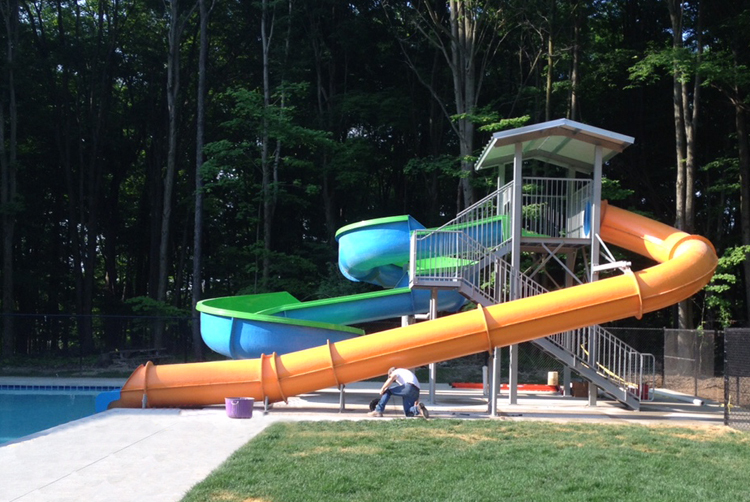 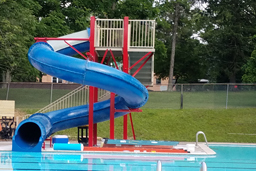 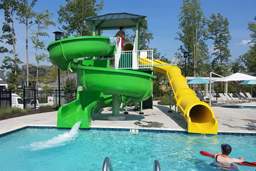 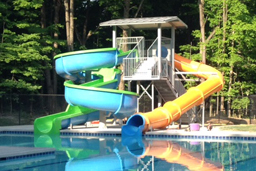 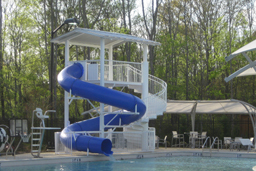 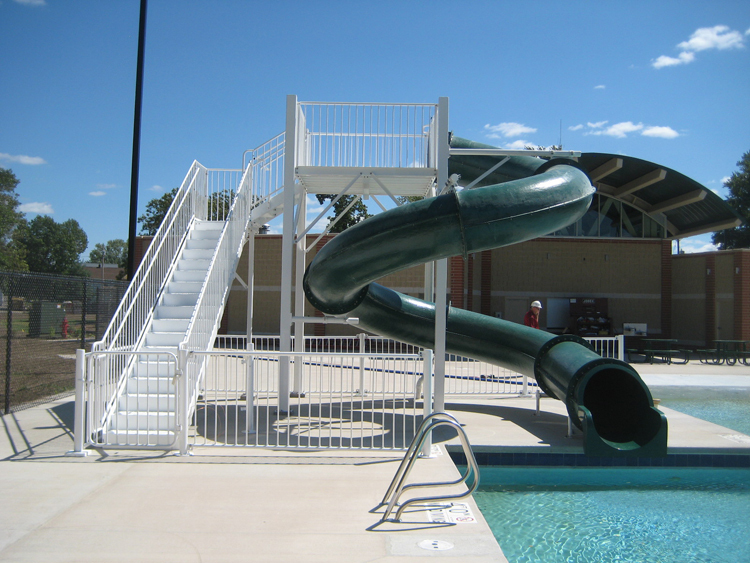 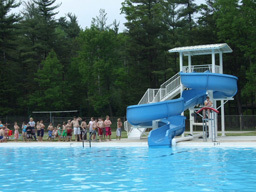 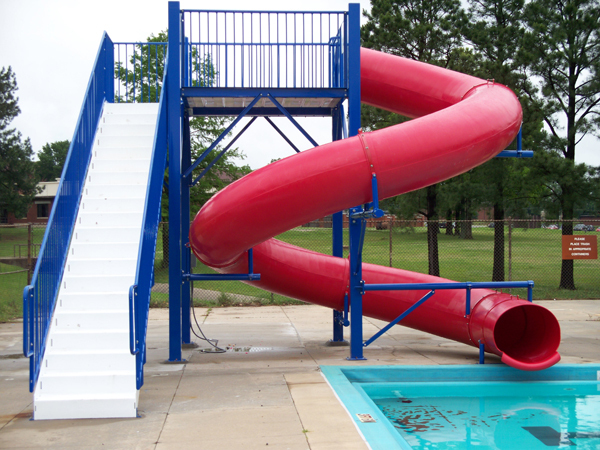 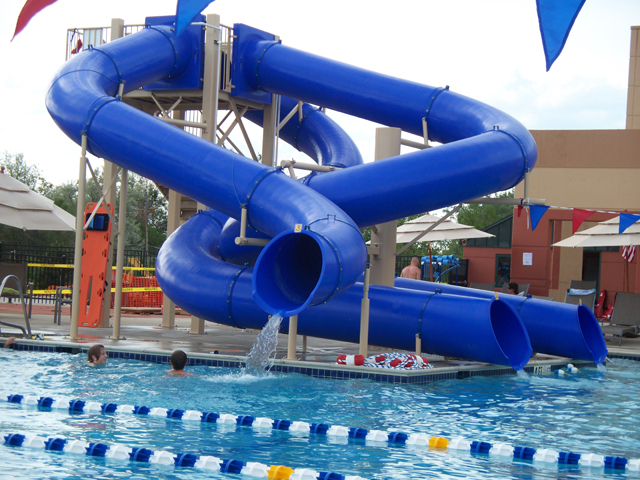 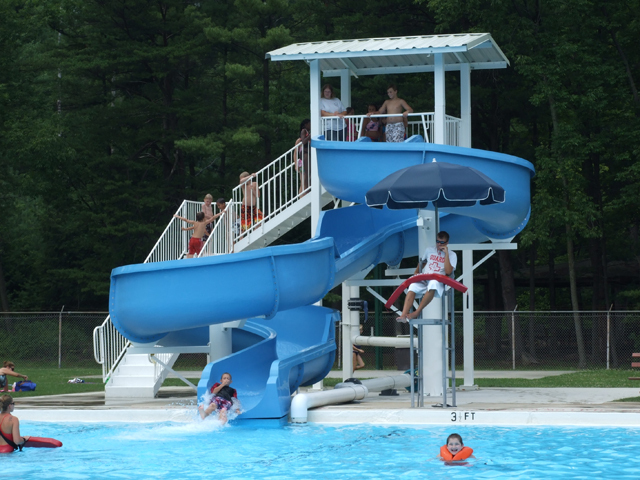 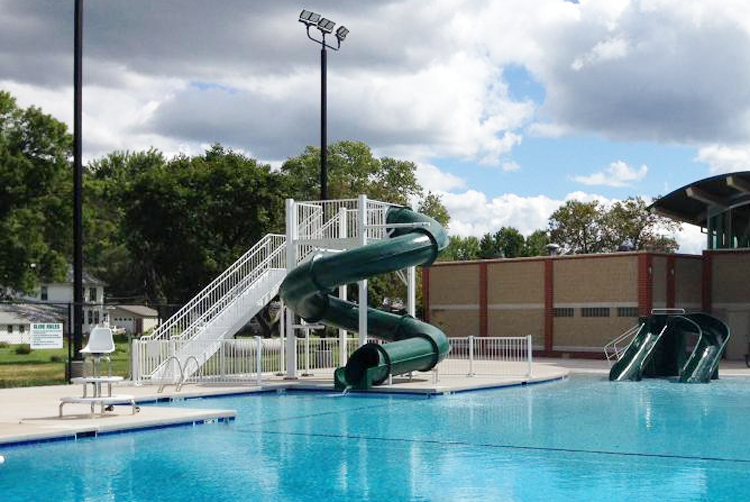 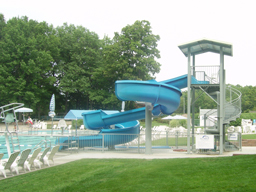 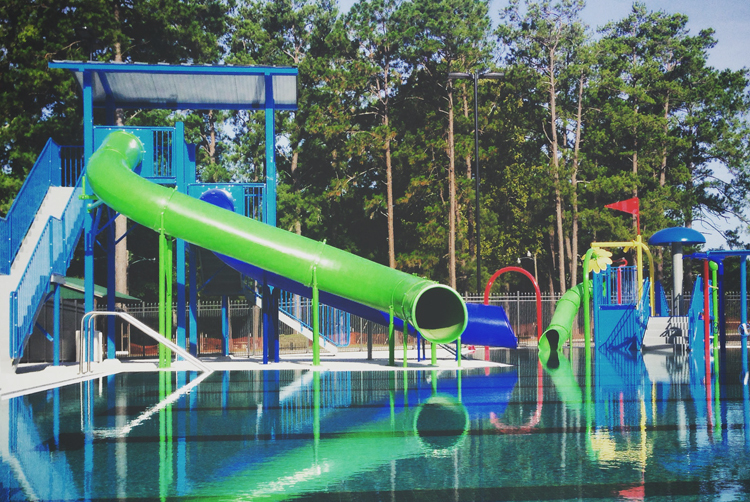 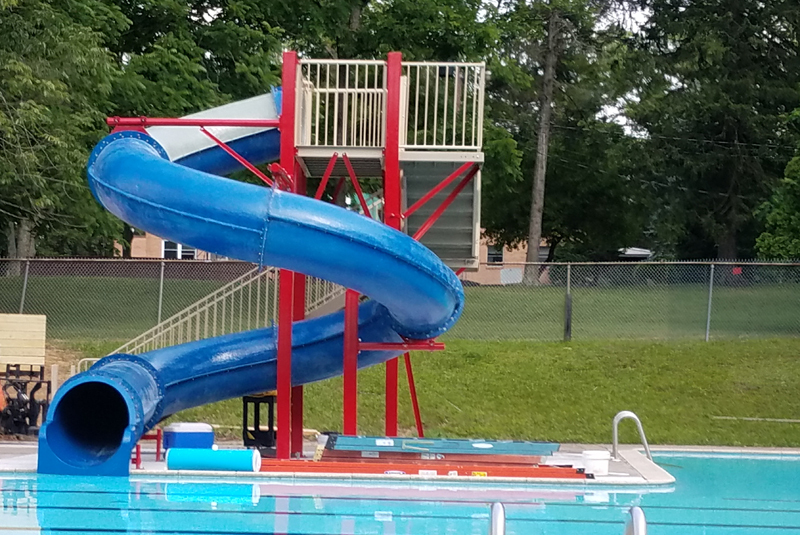 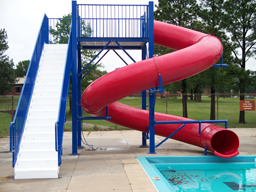 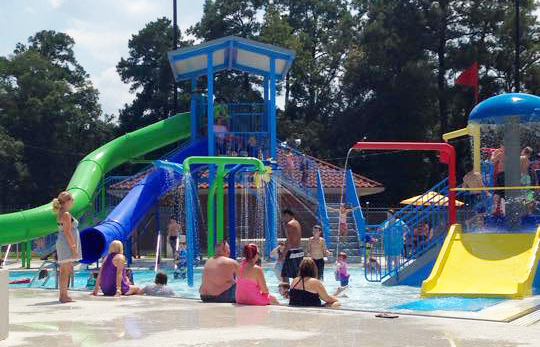 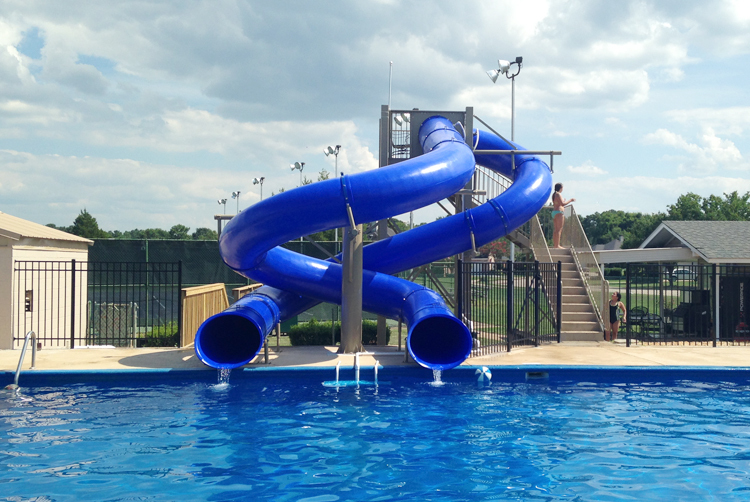 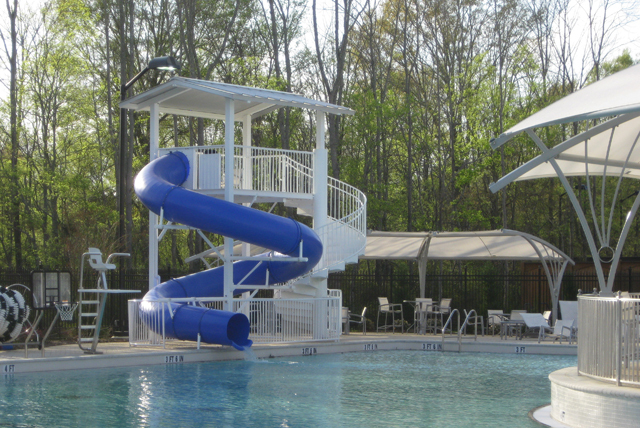 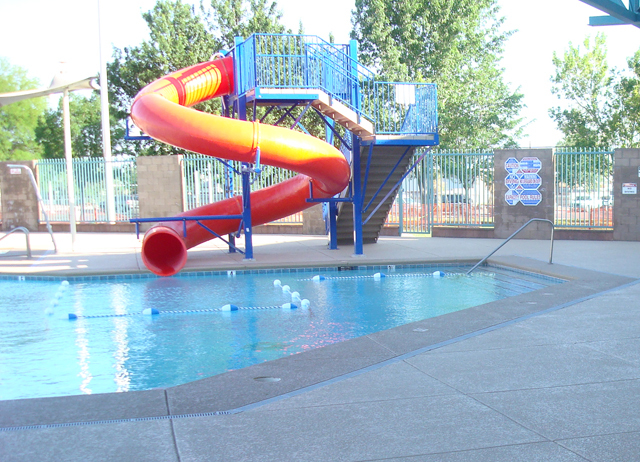 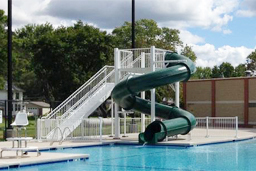 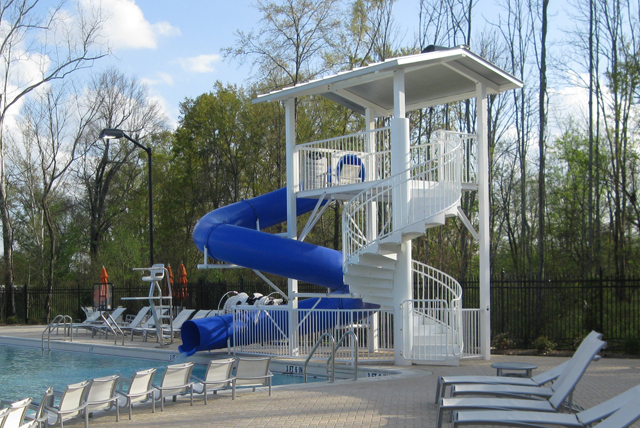 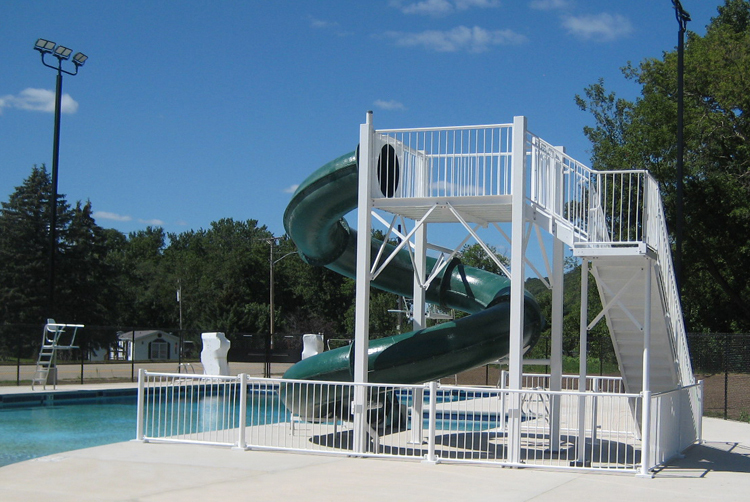 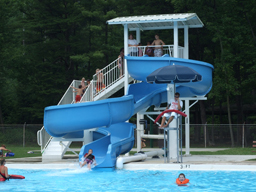 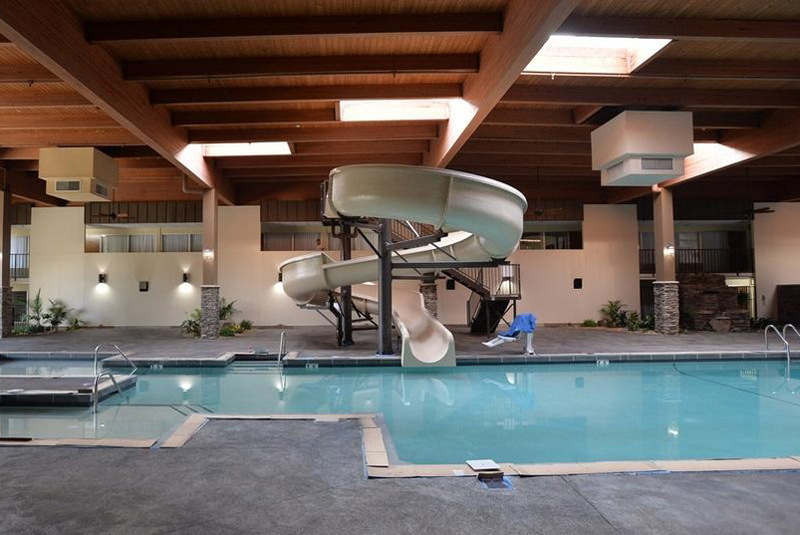 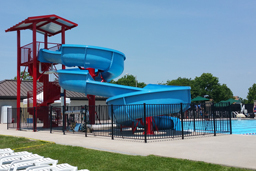 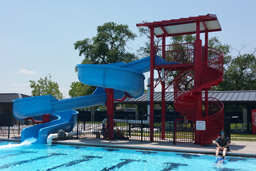 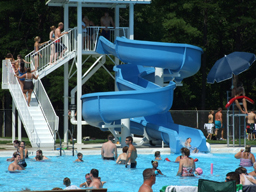 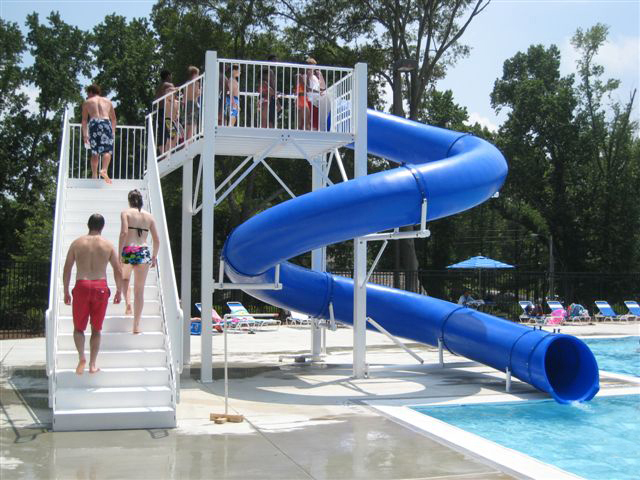 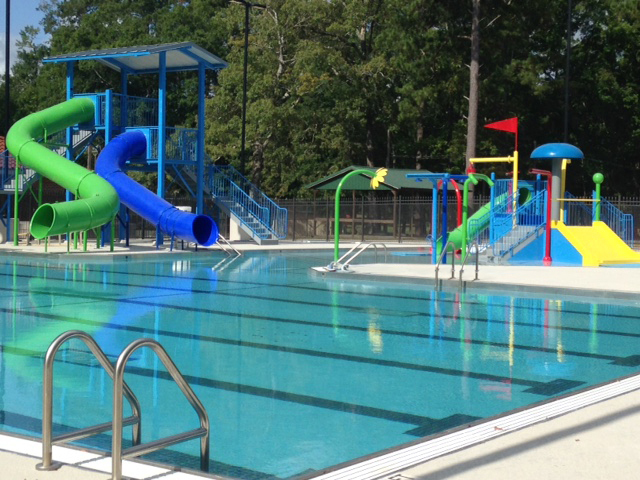 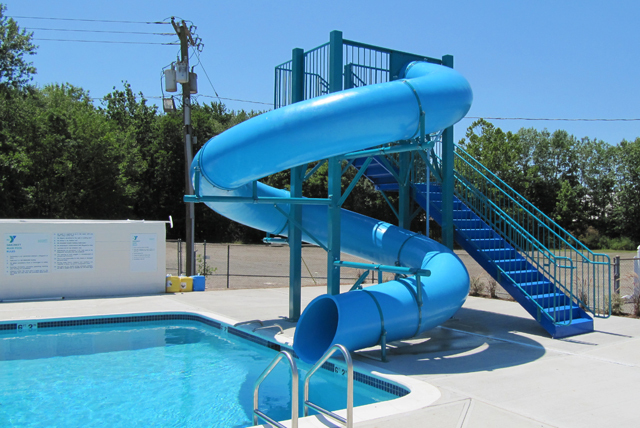 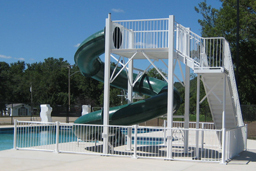 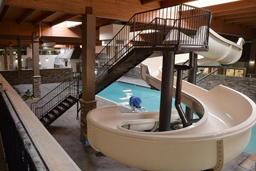 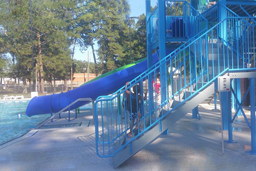 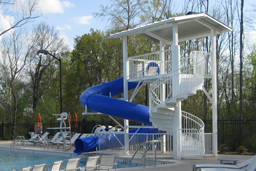 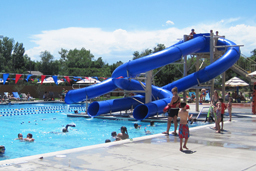 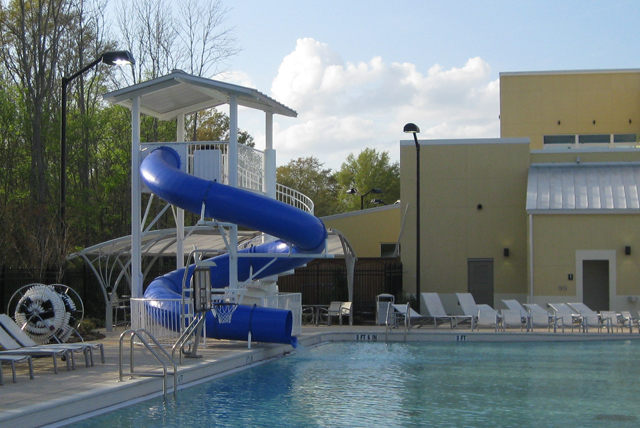 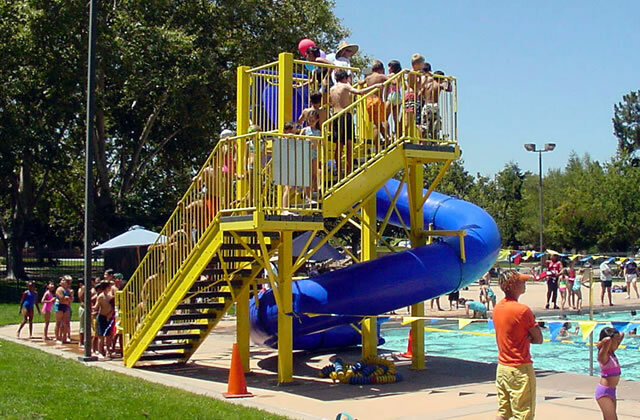 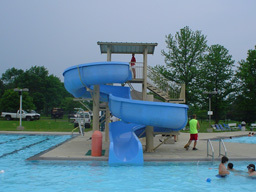 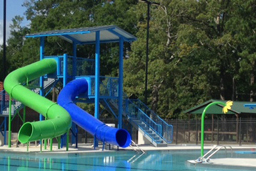 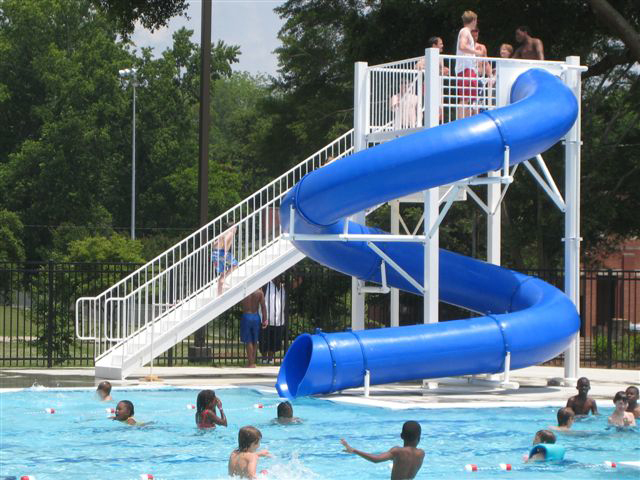 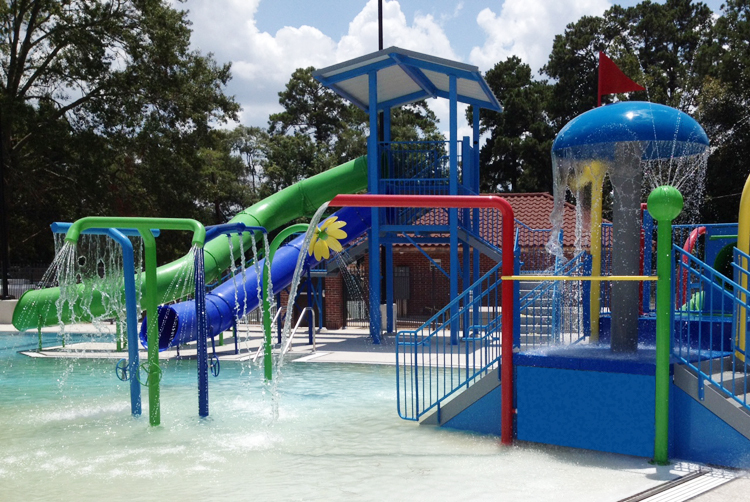 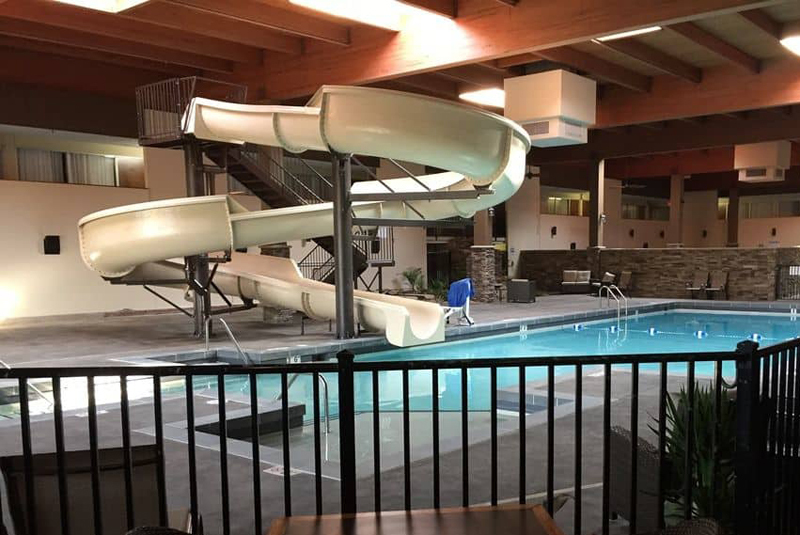 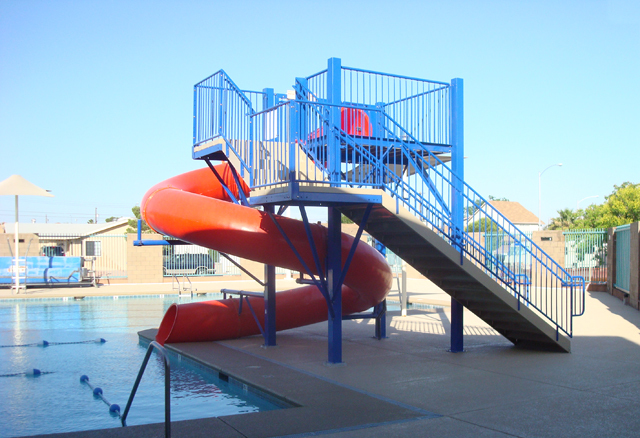 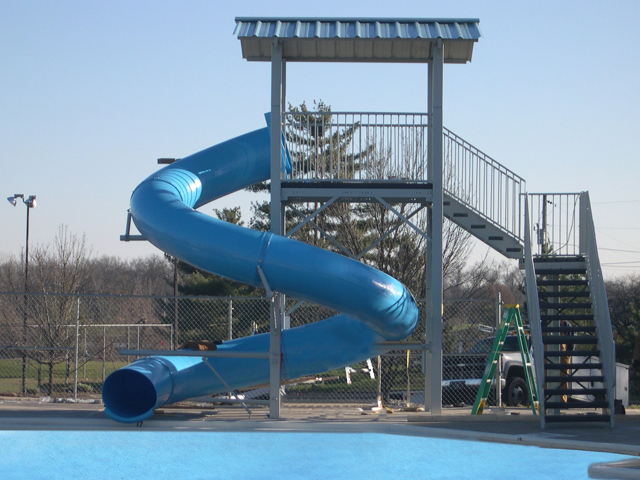 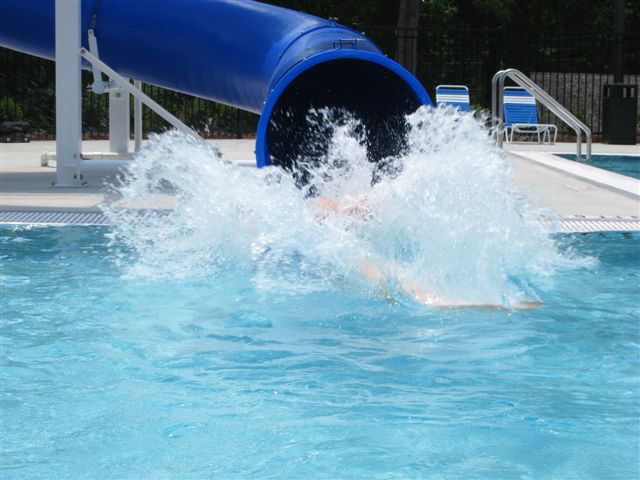 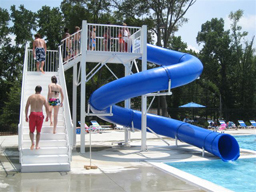 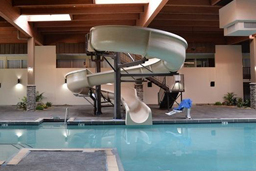 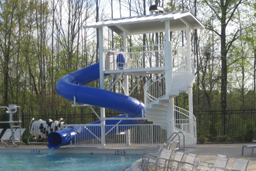 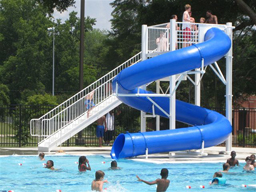 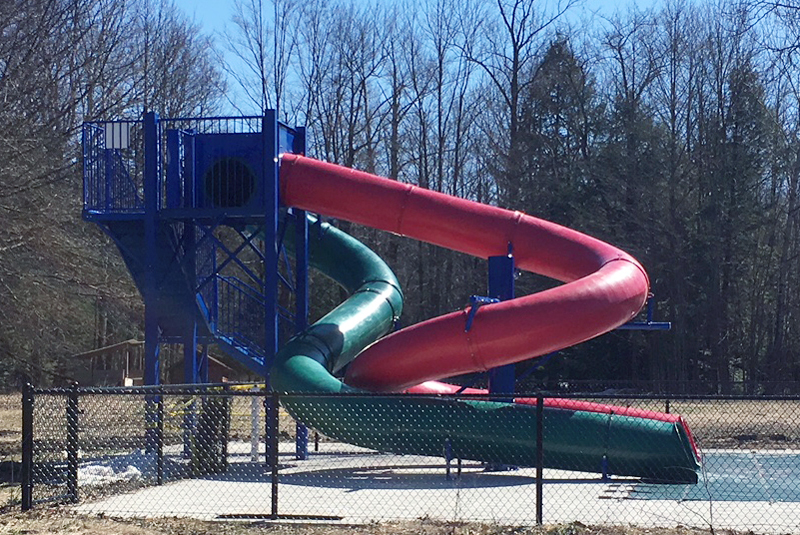 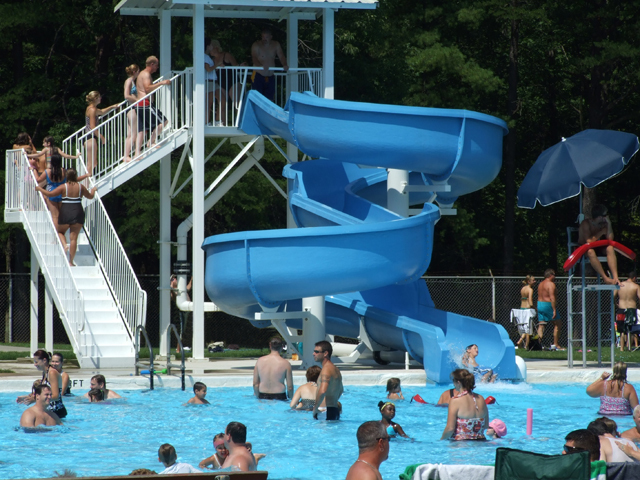 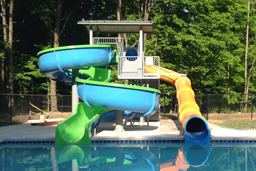 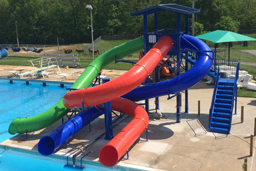 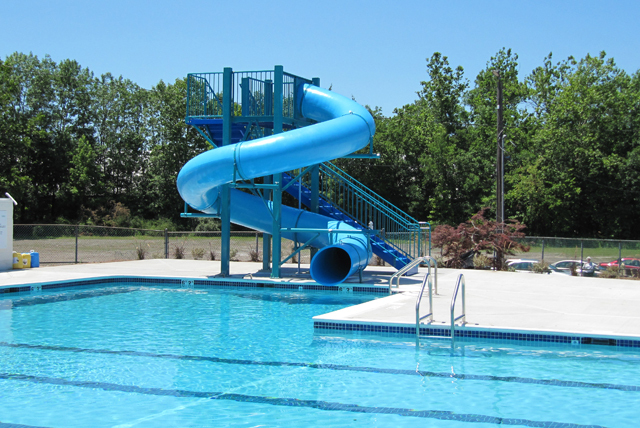 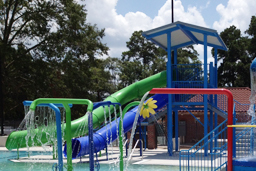 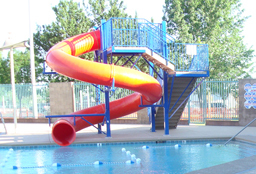 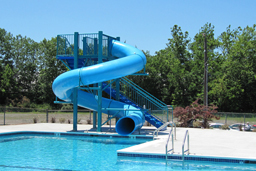 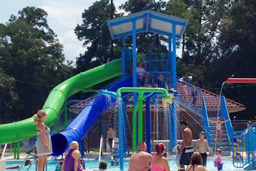 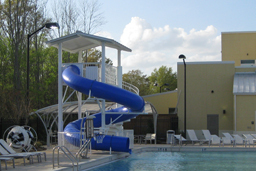 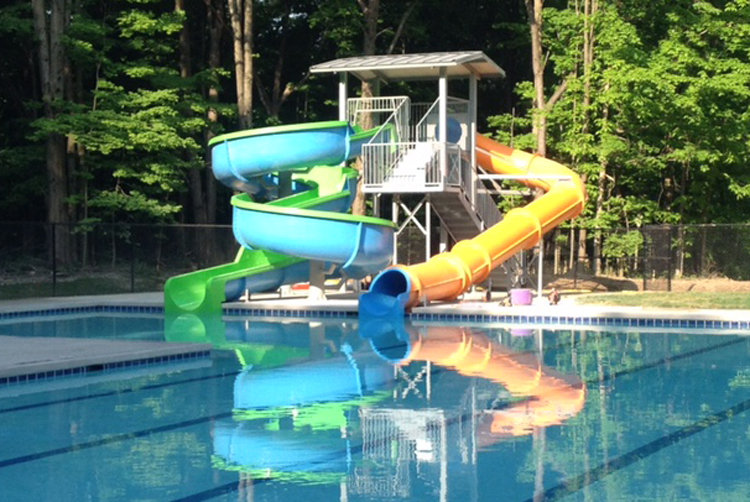 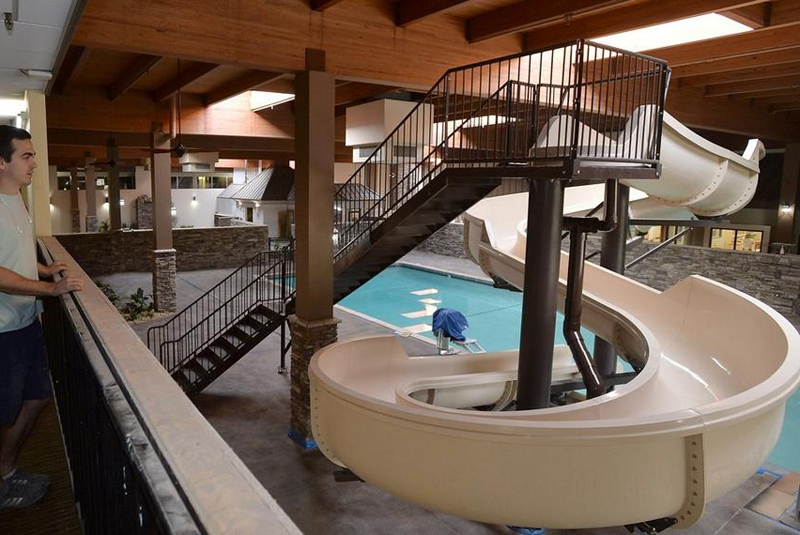 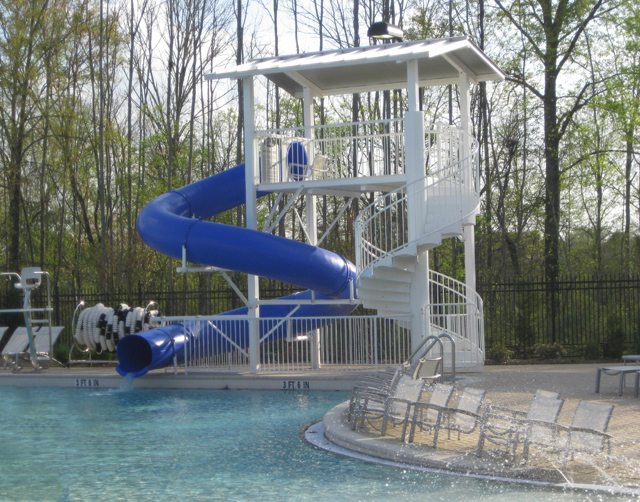 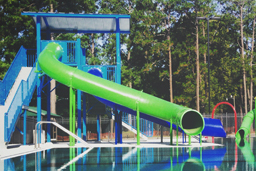 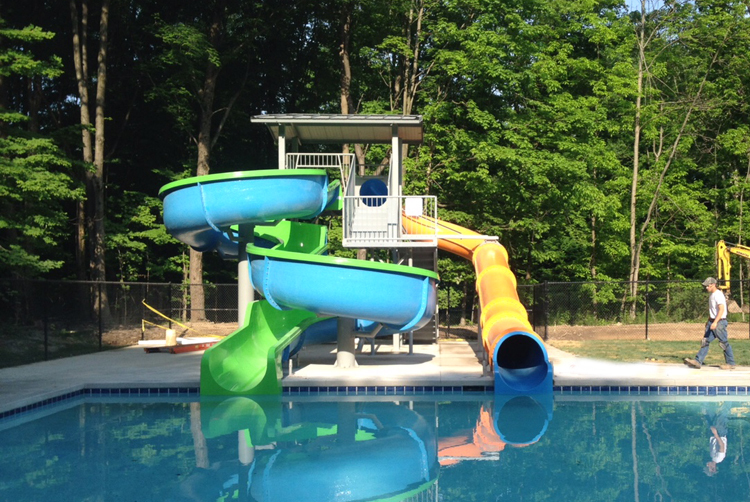 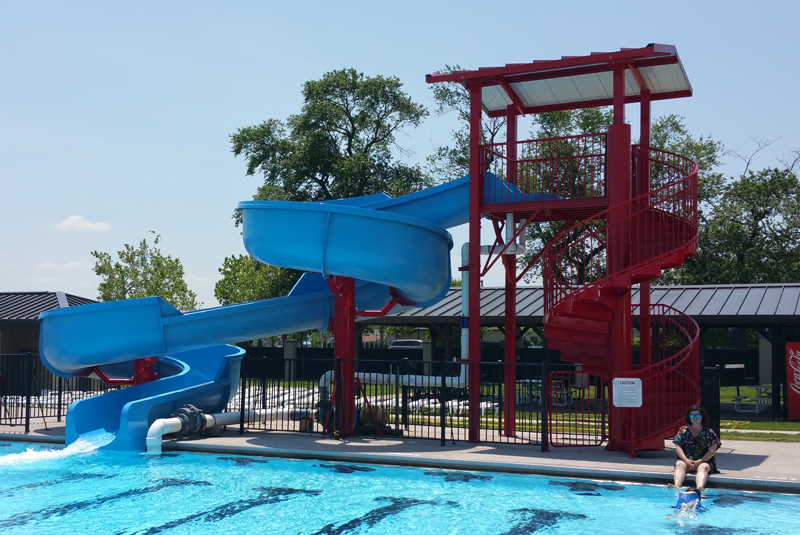 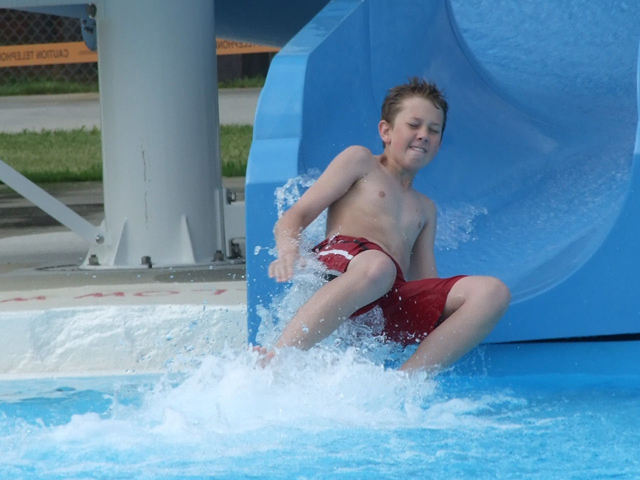 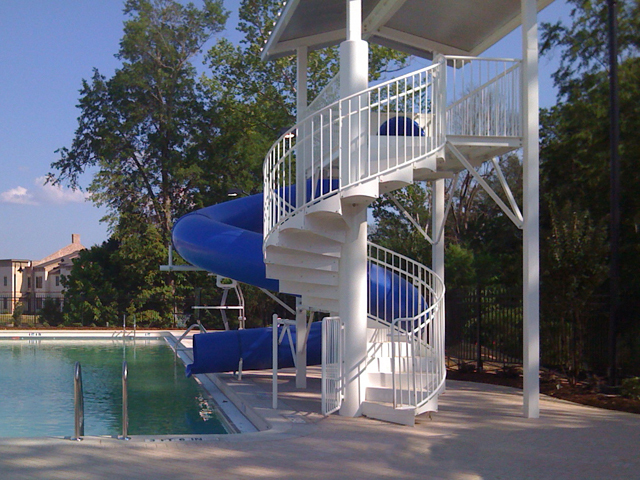 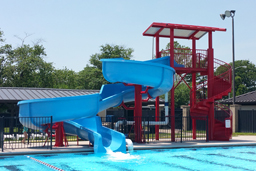 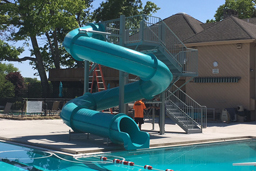 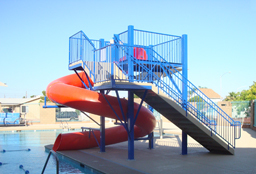 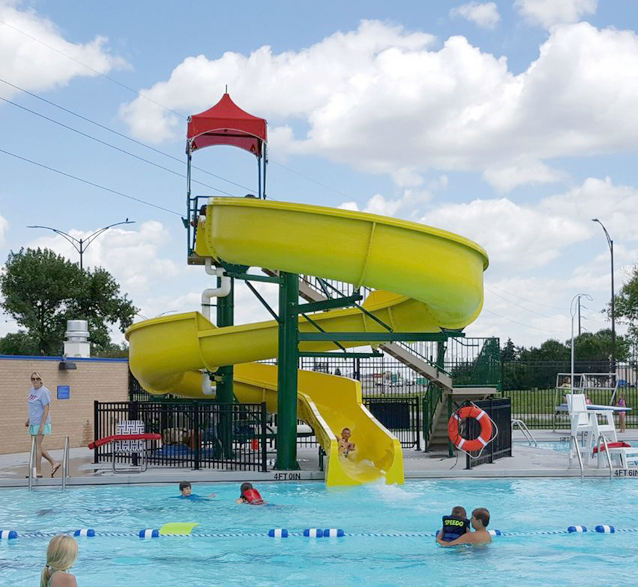 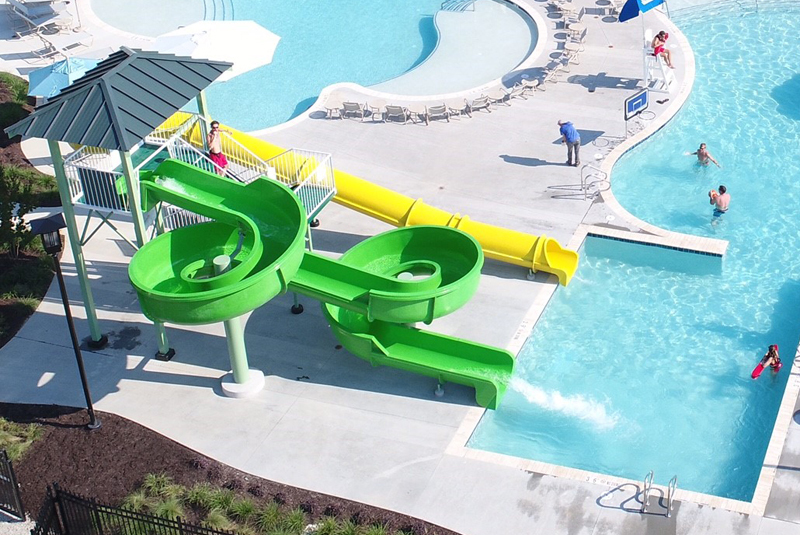 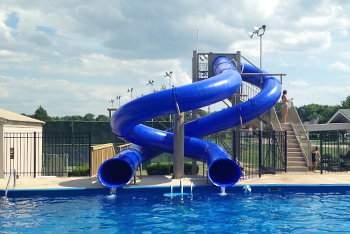 Centerline Run : 58' 2"
Entry Height : 12' 9"
· 36" wide stairs: 15' 3" x 22' 9"
"The pool and the slide are a huge hit. We are averaging over 300 a day during the week! Last year we averaged about 20-30 at the old pool." 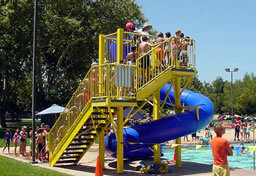 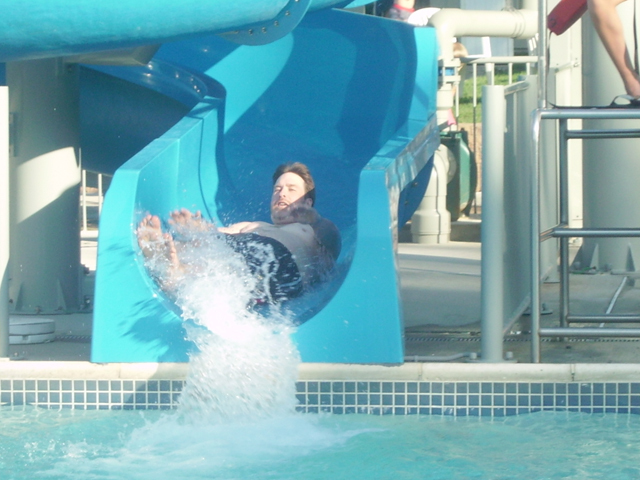 Description: Single 32" I.D.closed fiberglass flume water slide with 1¼ turns. 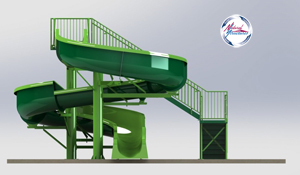 · Green flume: 21' 8" x 17' 2"
Description : Triple flume 30” I.D. 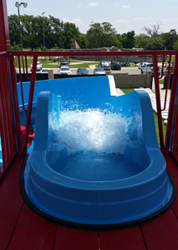 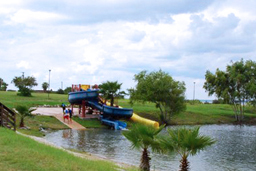 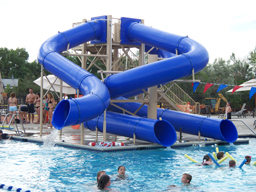 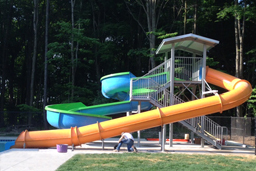 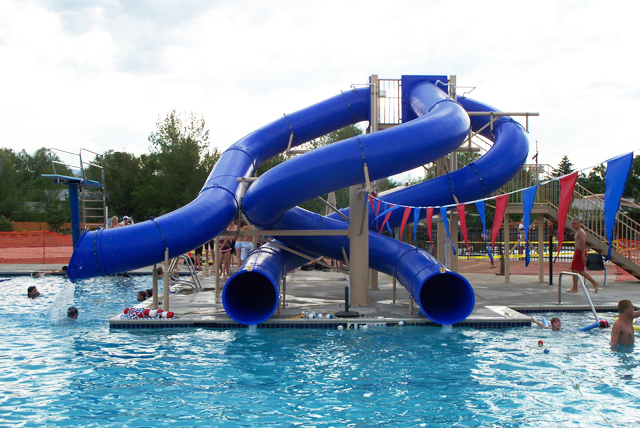 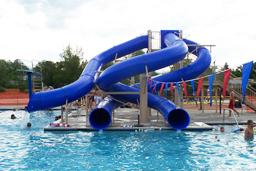 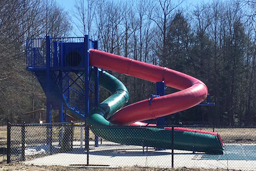 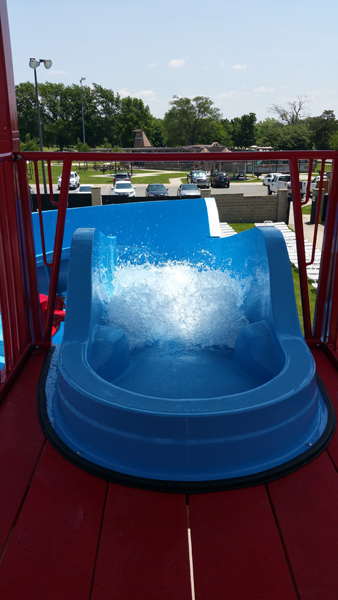 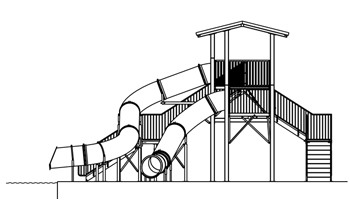 polyethylene water slide, (1) 360°, (1) 180° and (1) 90° curves. 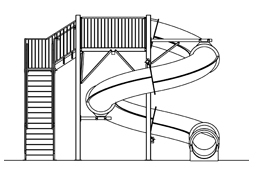 Space Requirements : 33’ 2” x 28’ 7” – Space requirements may vary with options chosen. 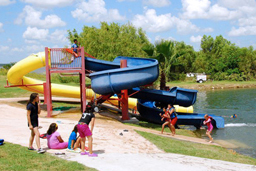 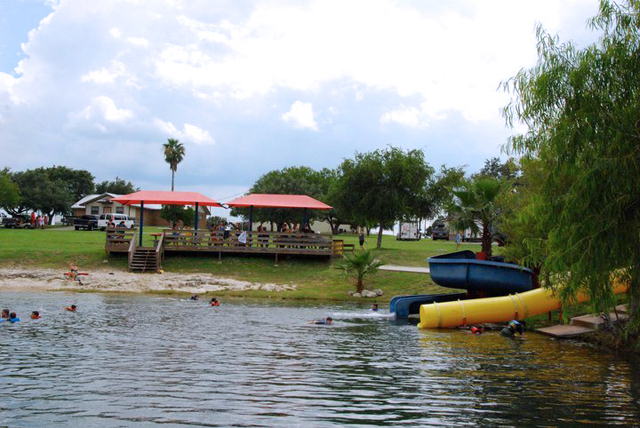 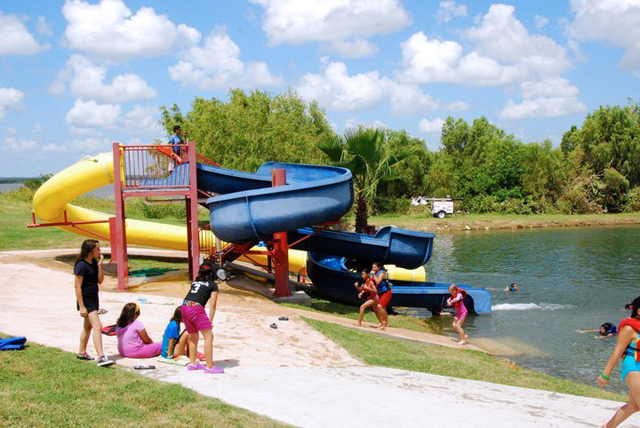 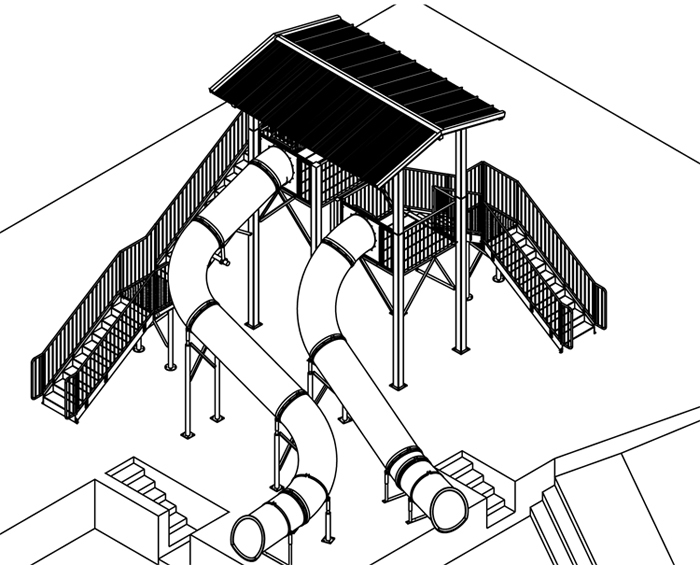 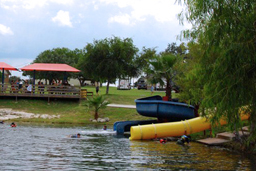 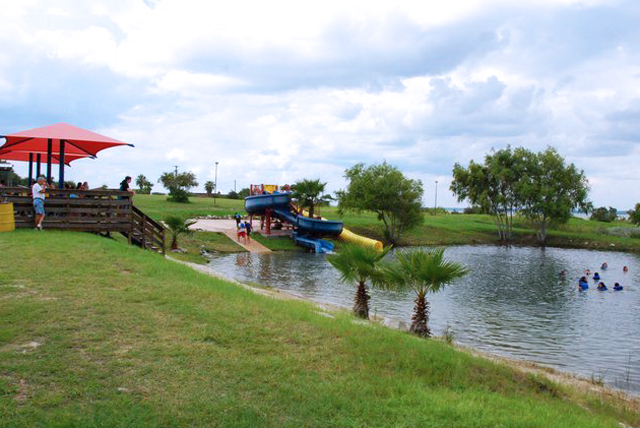 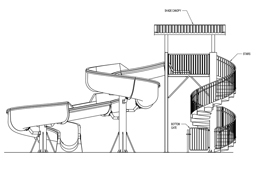 Flumes 1 & 2: 20’ 1” x 20’ 0"; Flume 3: 12’ 6” x 20’ 0"
Flume 3: Blue flume: 5' 6" or 9' 0"; Green flume: 5' 0"
Centerline Run : 57' 5" & 44' 11"
Space Requirements : 24' 10" x 28' 8-3/8" – Space requirements may vary with options chosen. 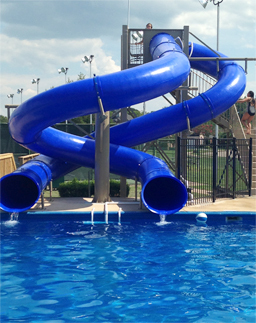 Splash down dimension 23' 2" x 20' 0"
Description : Double 30” I.D. 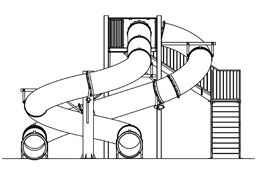 polyethylene flume water slide. 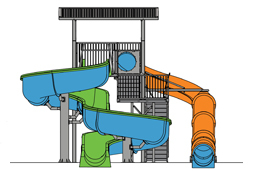 Space Requirements : 35’ 7” x 28’ 9” – Space requirements may vary with options chosen. 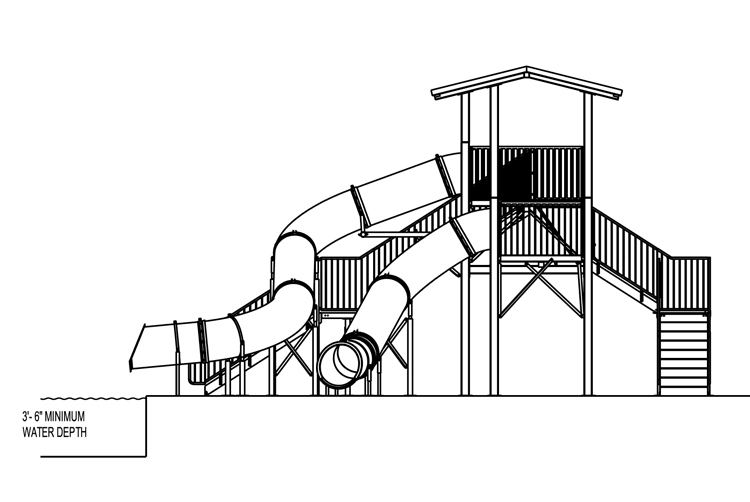 Splash down dimensions (each flume): 12’ 6” x 20’ 0"
Description : Single fiberglass open flume water slide with (2) 360° reverse curves. 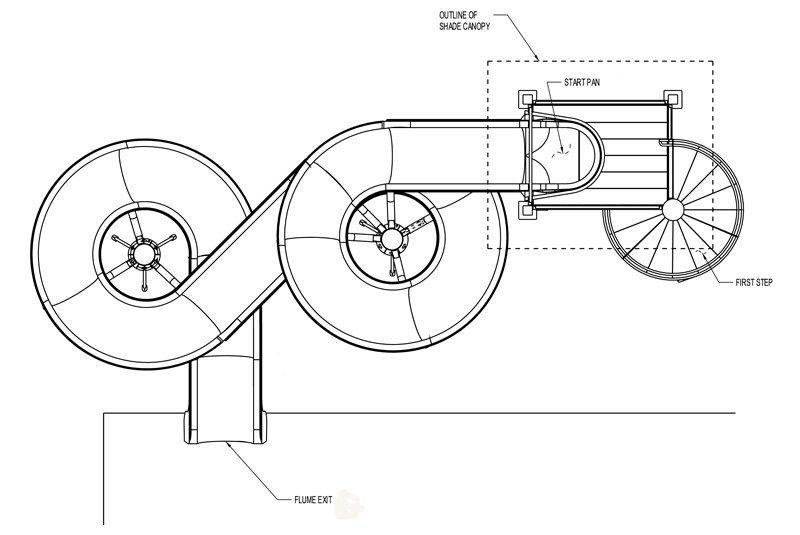 Centerline Run : 85' 4 "
Entry Height : 12' 10 "
Deck Space Requirement: Varies with options chosen. 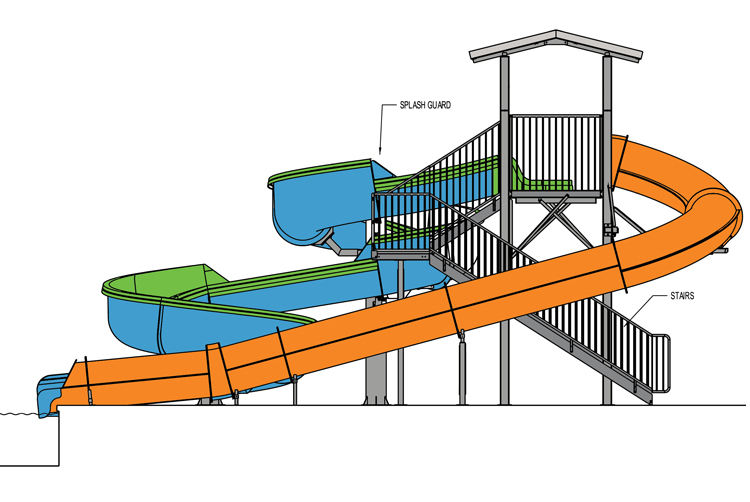 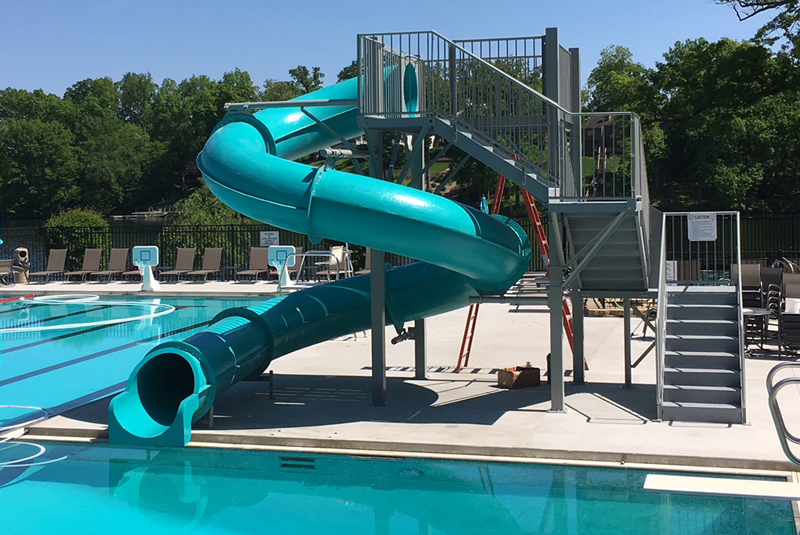 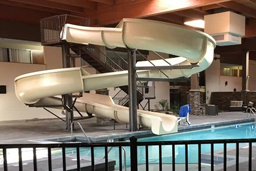 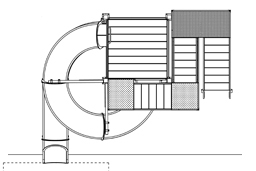 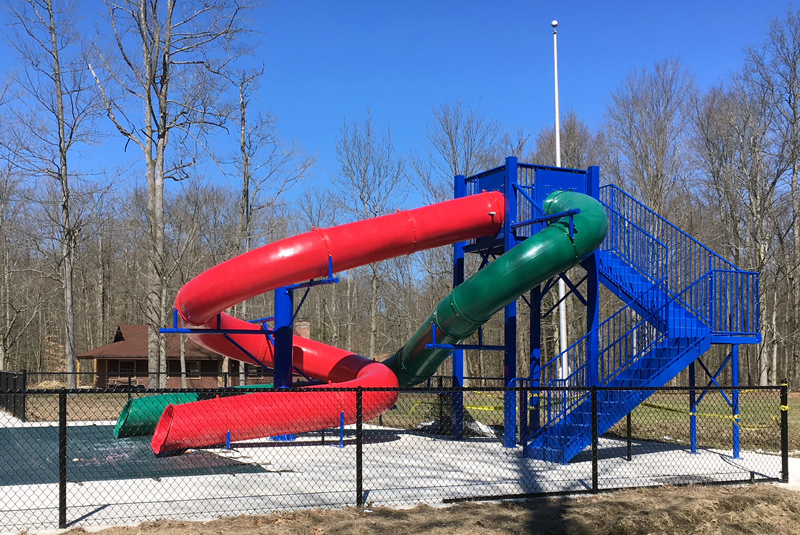 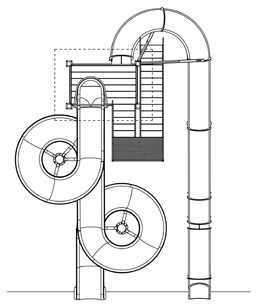 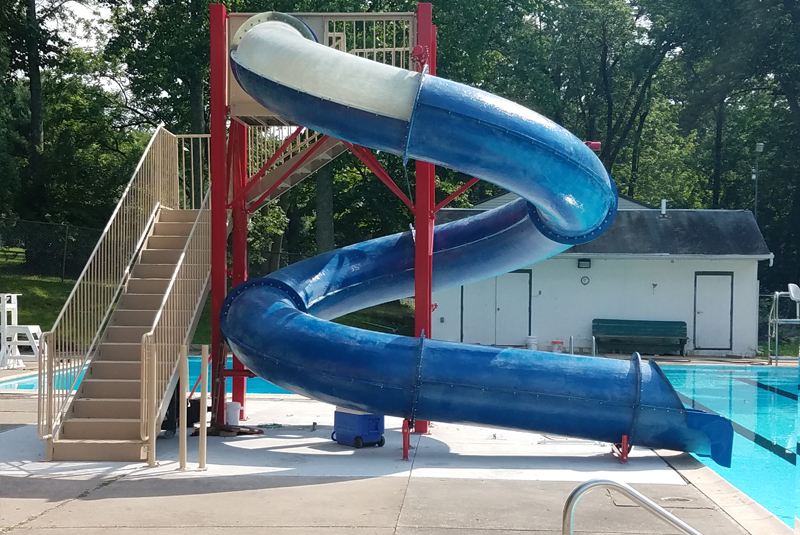 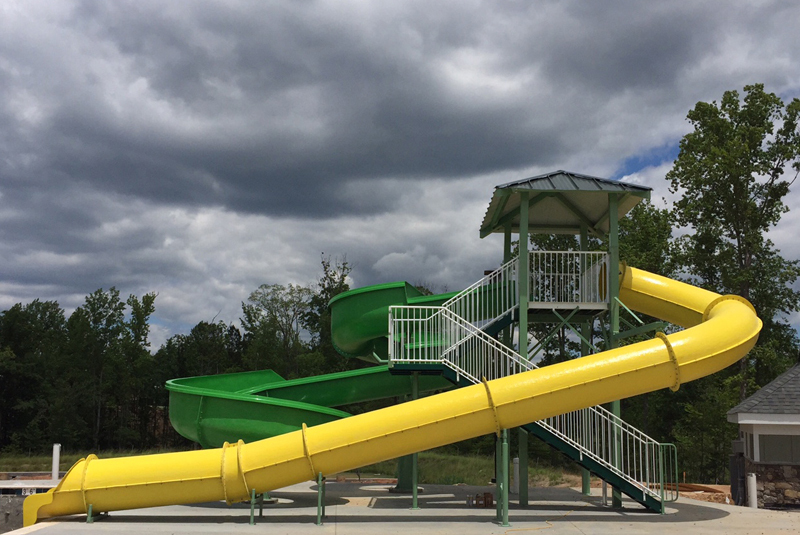 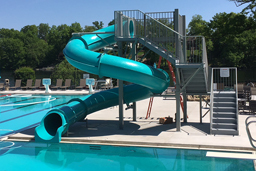 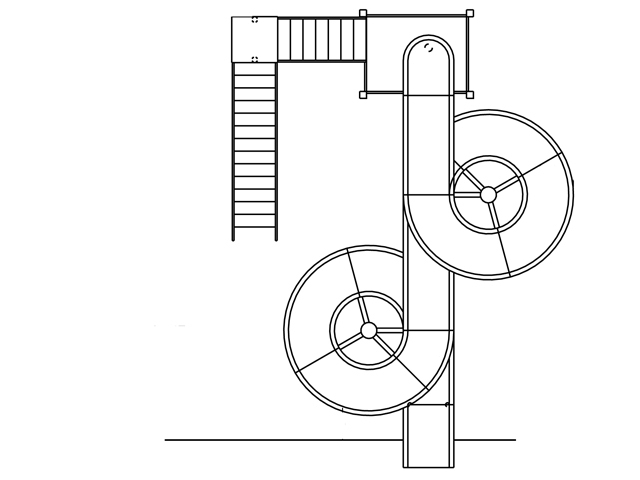 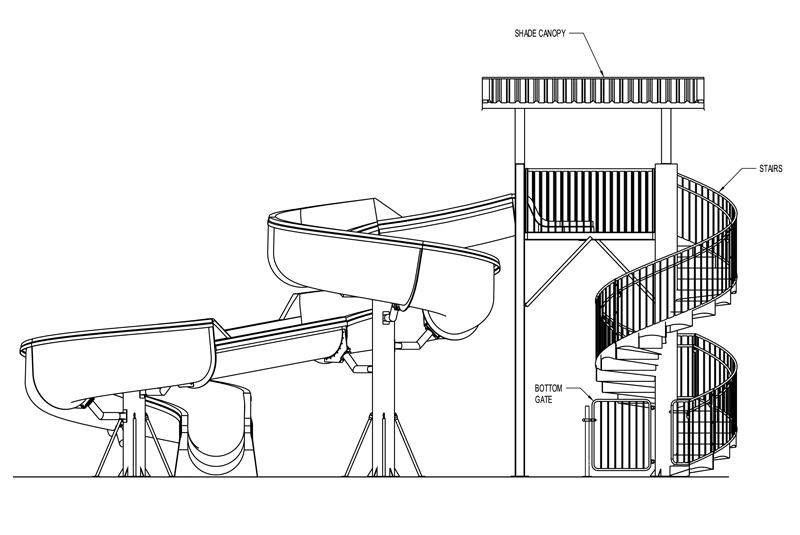 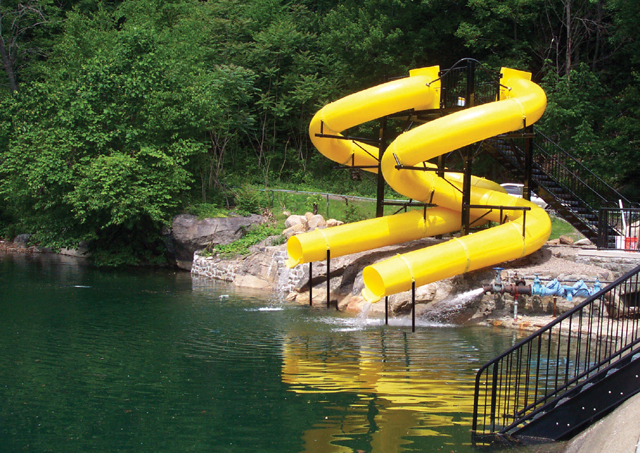 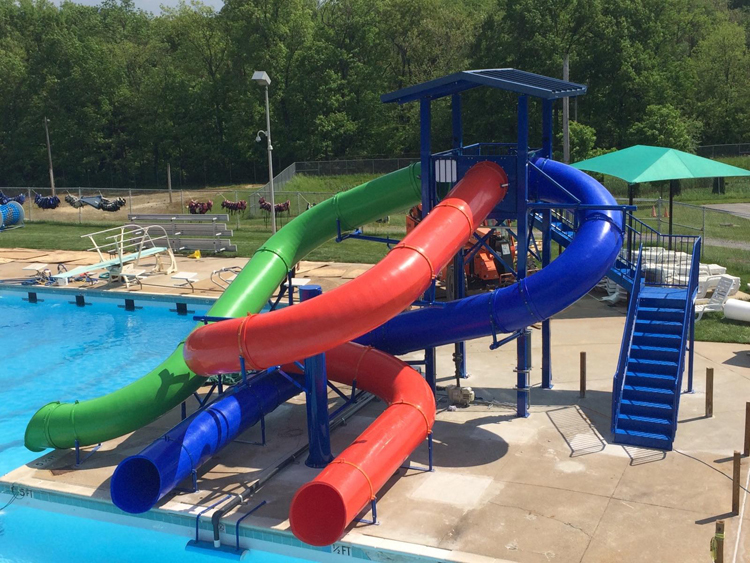 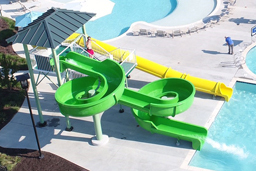 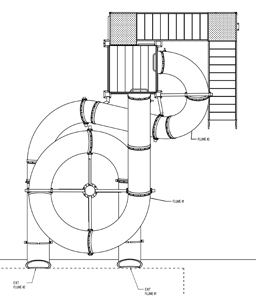 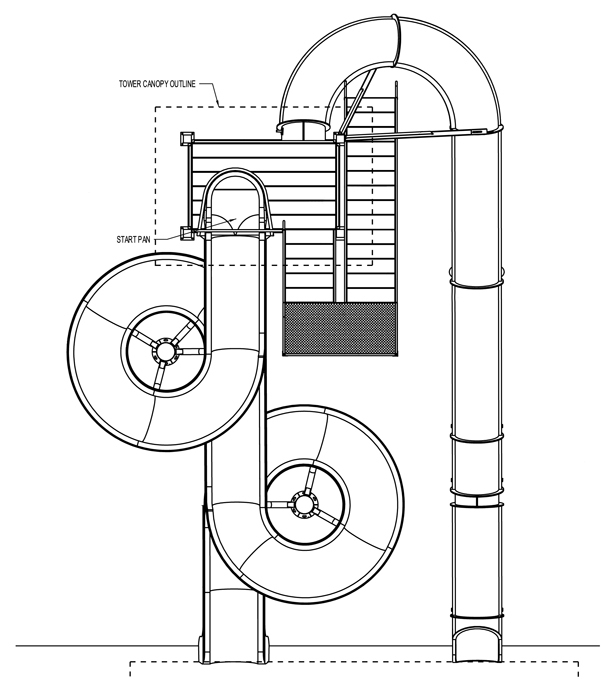 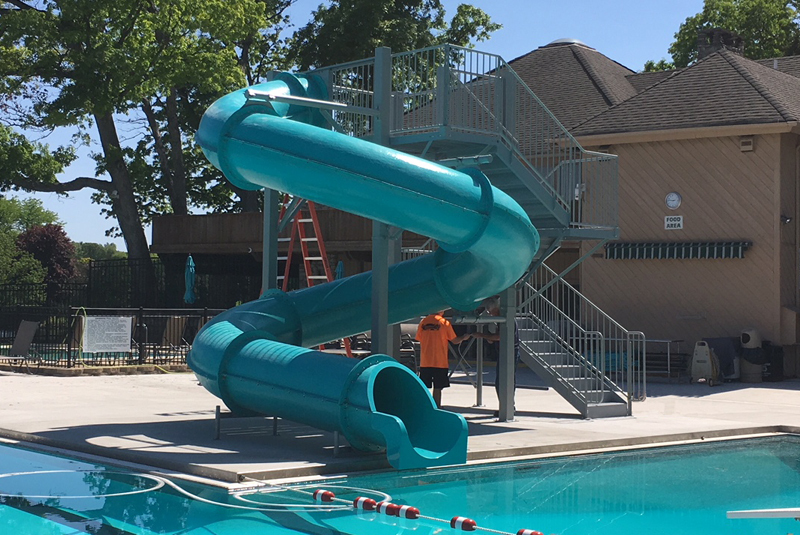 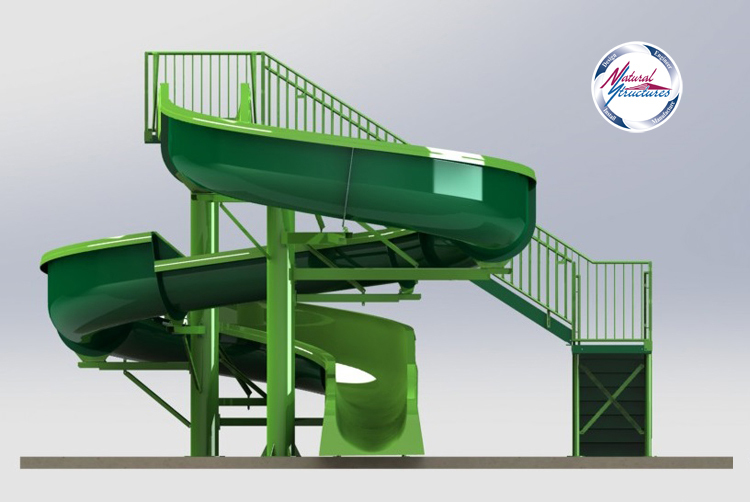 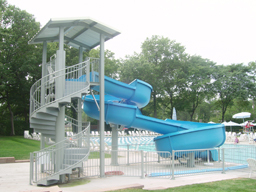 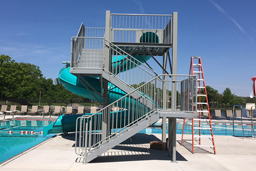 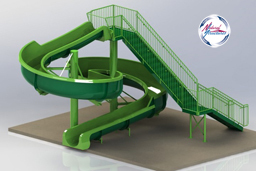 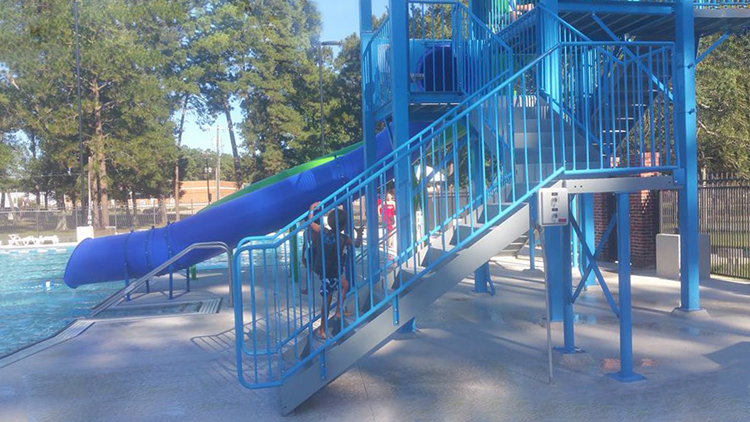 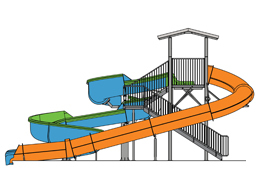 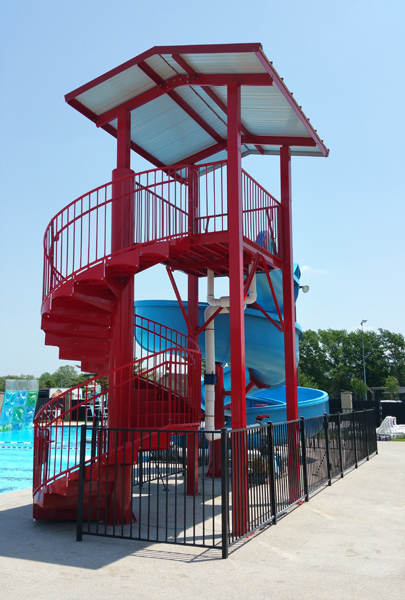 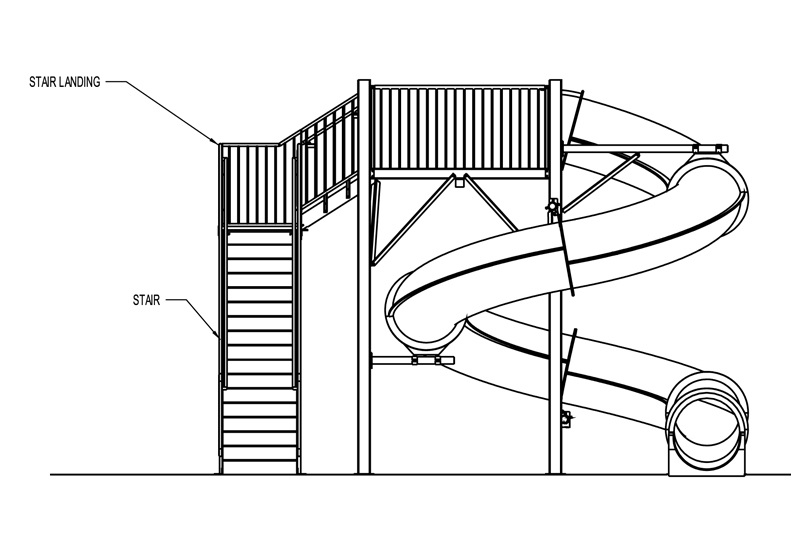 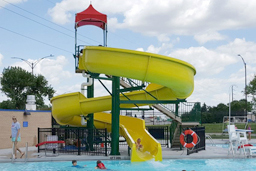 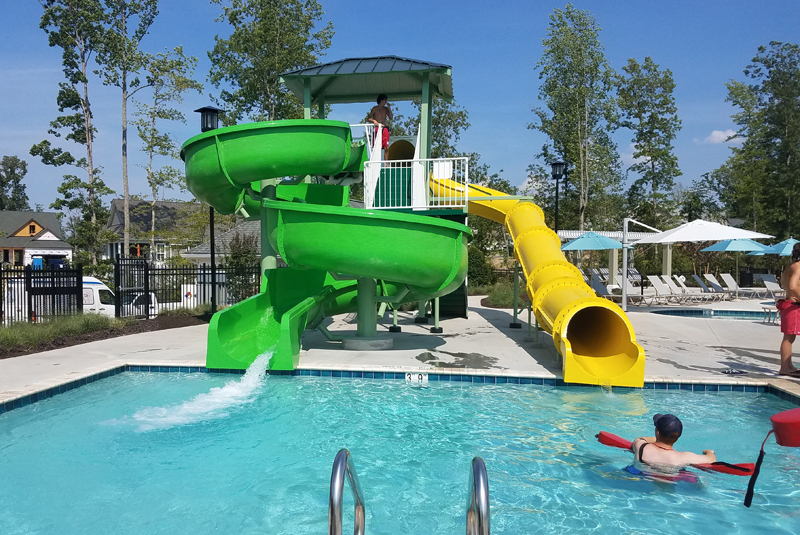 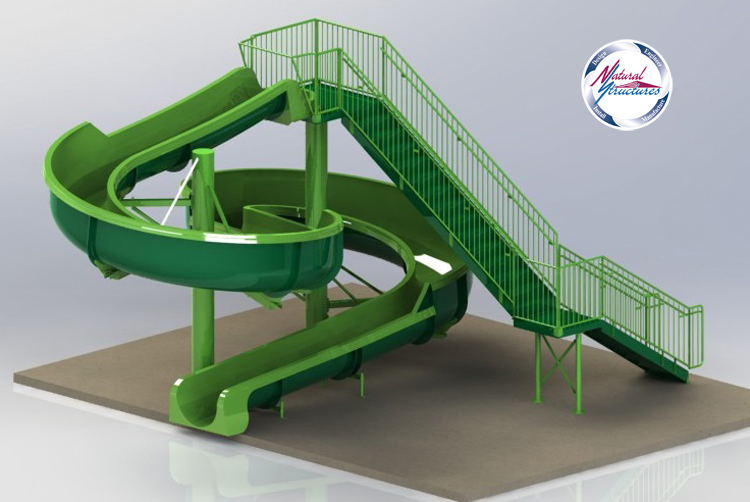 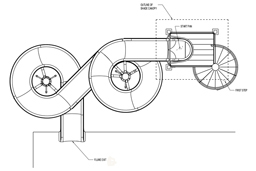 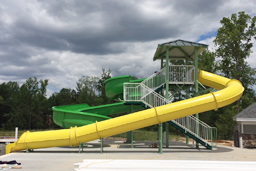 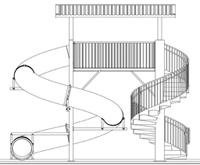 "L" Stairs: 24' 10 " x 31' 3"
"U" Stairs: 23' 10 " x 31' 8"
"Spiral" Stairs: 21' 0" x 36' 9"
Description : Single fiberglass open flume water slide with 360° curve & 270° reverse curve. 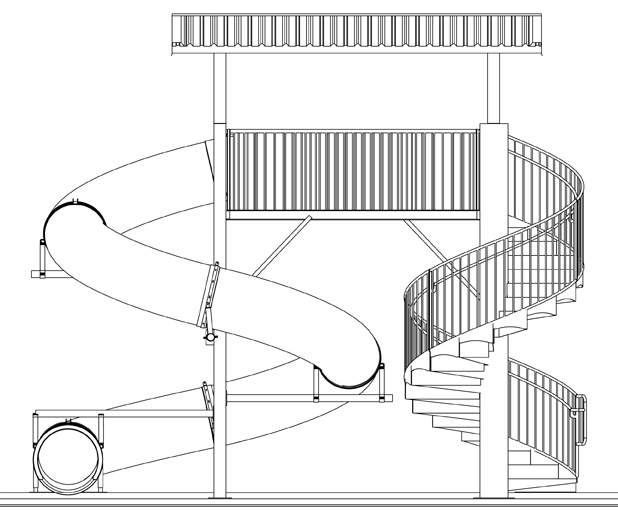 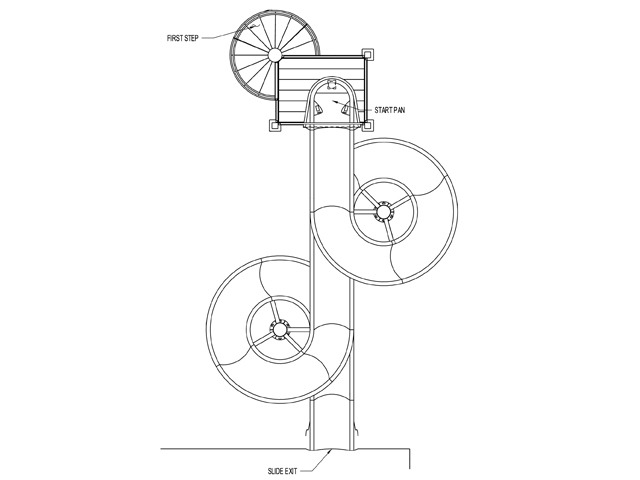 Centerline Run : 85' 7 "
Deck Space Requirement: 38' 1" x 16' 9" - Varies with options chosen. 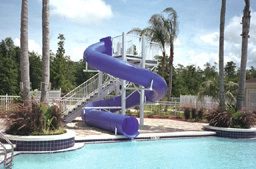 Description : Double fiberglass flume water slide featuring: 36” I.D. 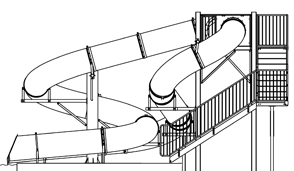 open fiberglass flume (Flume 1) and 32” I.D. 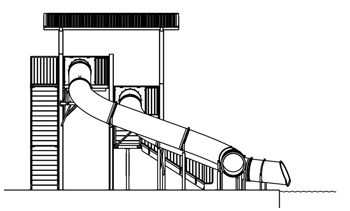 closed fiberglass flume (Flume 2). 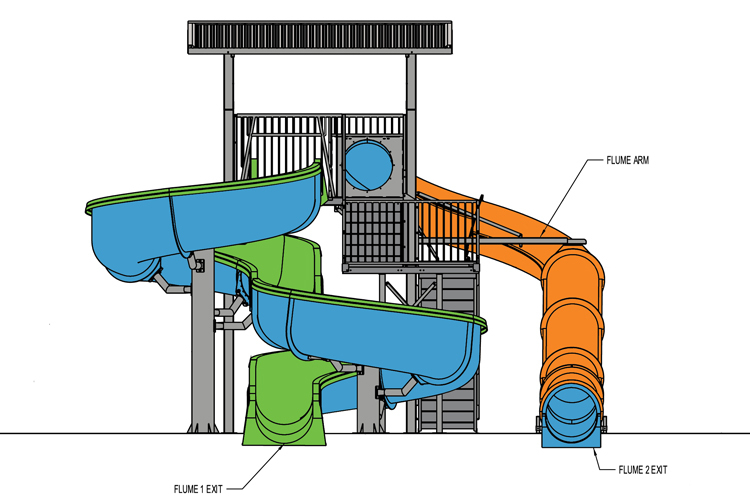 Space Requirements : 27' 4 " x 39' 7 "–Space requirements may vary with options chosen. 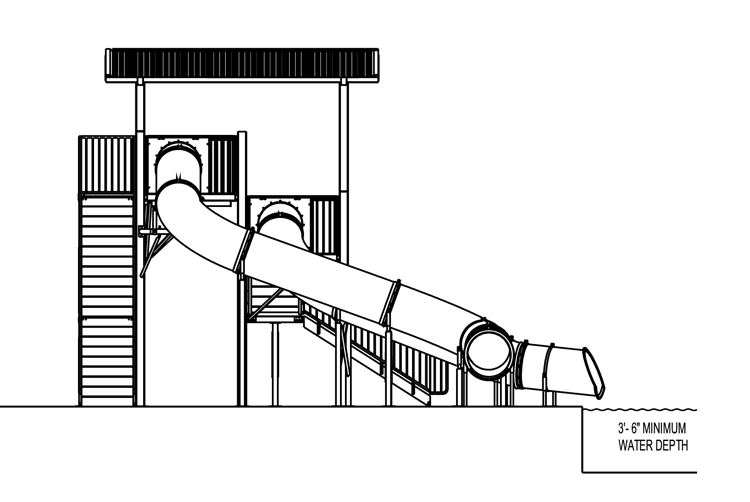 Closed (Flume 2): 20 to 40 gpm required. 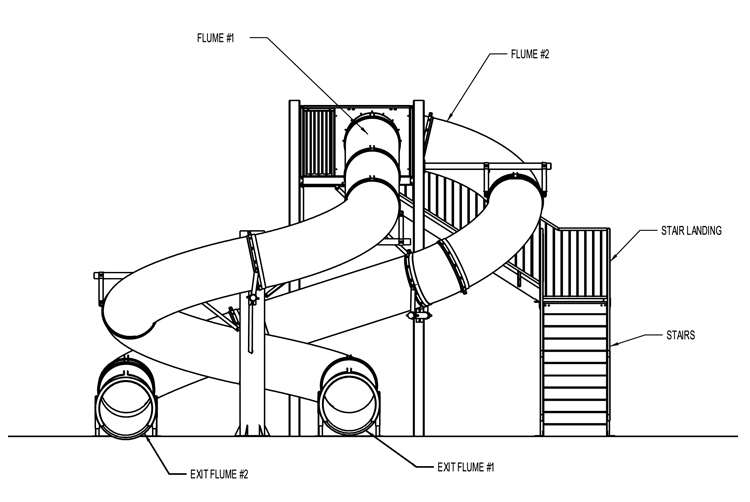 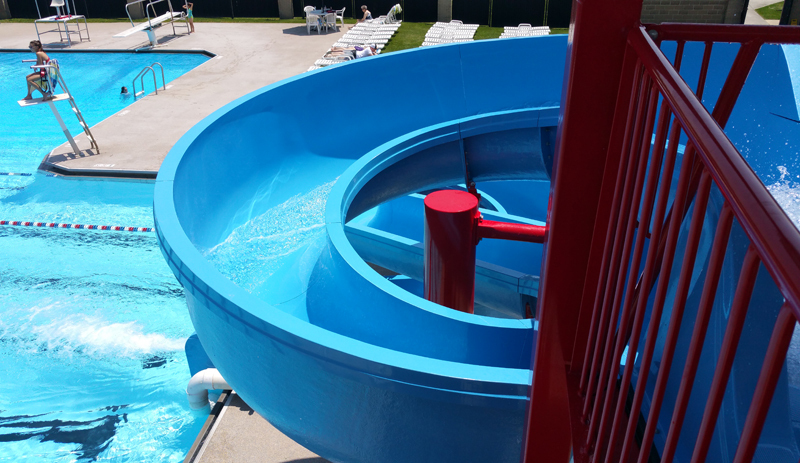 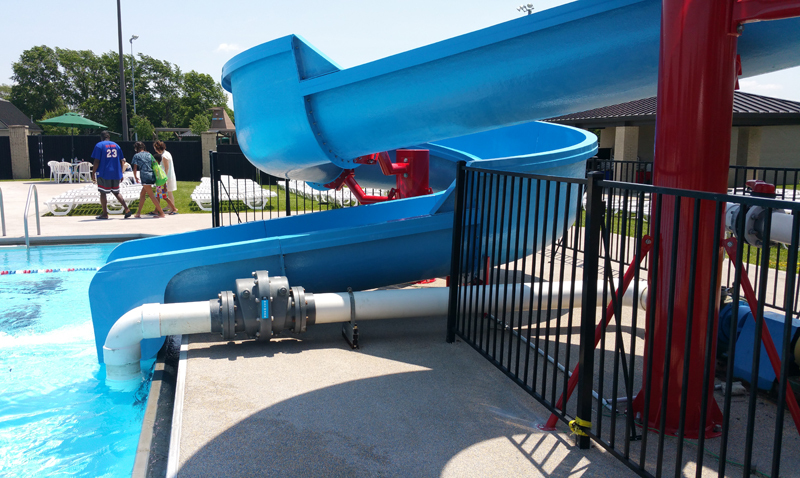 Splash down dimension 28' 0"x 20' 0"
Description : Double flume water slide featuring (1) polyethylene closed flume with 90° curve and (1) fiberglass open flume water slide with (2) 360° spirals. 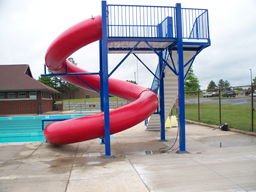 Centerline Run : Fiberglass (open) 85' 4 "
Space Requirements : 25' 10 " x 31' 9 "–Space requirements may vary with options chosen. 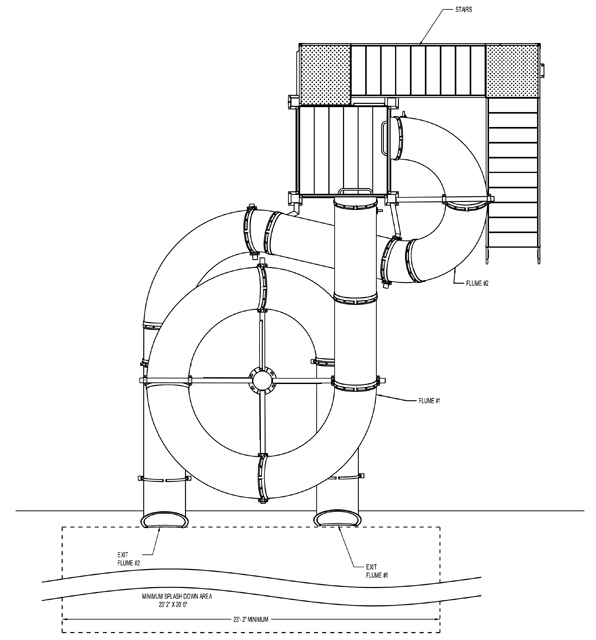 Closed: 20 gpm water flow recommended; 20 to 40 gpm required. 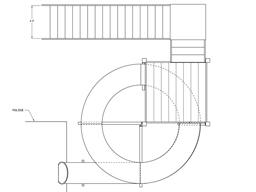 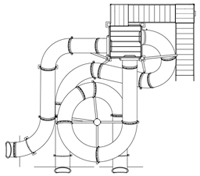 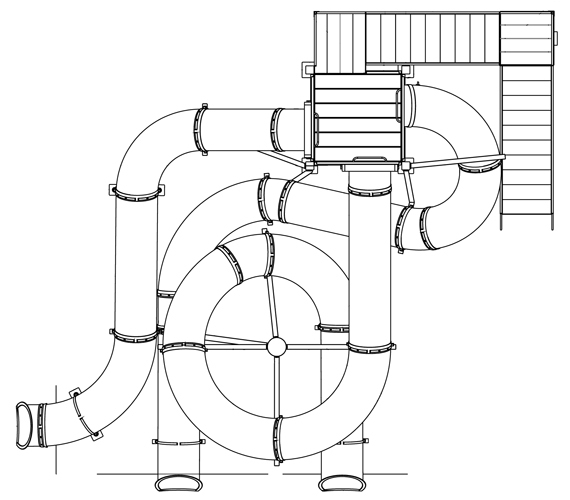 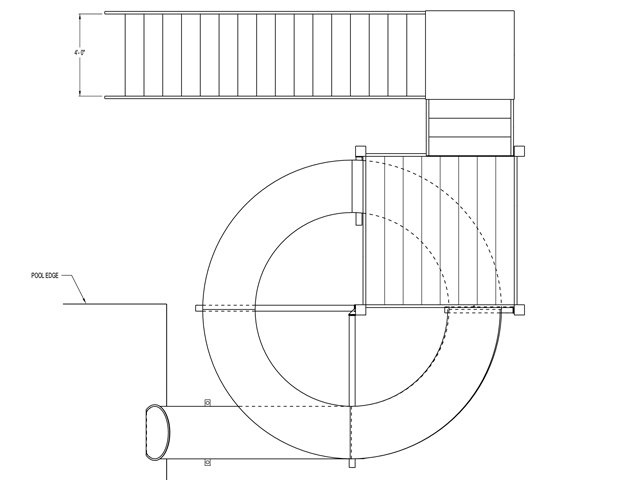 Description : Single, open flume fiberglass slide with 1½ spiral turns. 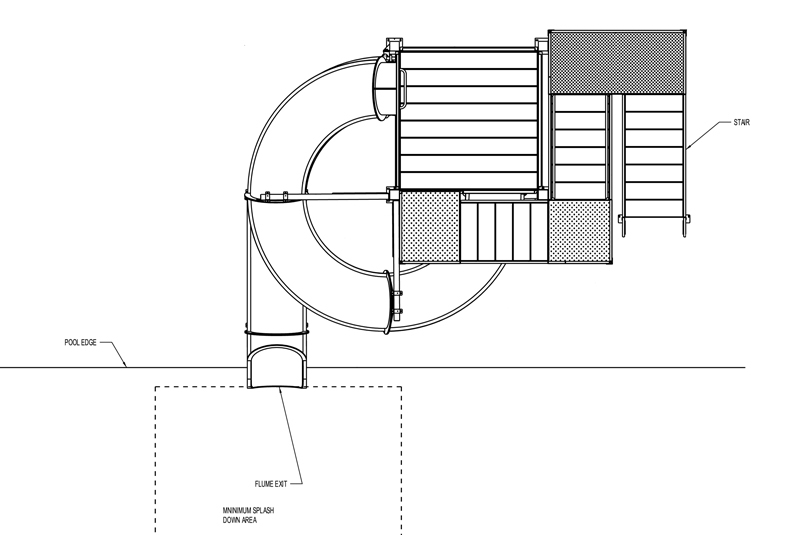 Centerline Run : 93' 3"
Entry Height : 13' 5"
Space Requirements: 25' 7" x 24' 8" - Varies with options chosen. 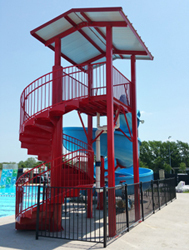 Entry Height 12' to 13' 11"